This wireless Headset provides superior audio quality, range and battery life. The headset can be configured to be worn over-the-ear or over-the-head. All the adapters are included to connect to your X16 phone with a 2.5 mm headset connector. CLICK HERE for the X16 headset that ships with the 3.5mm adapter. The headset is activated by pressing the "Feature" Button on the X16 phone and then pressing the digit 9. Feature Code 9 can also be programmed on a single button so the headset can be enabled and disabled by pressing the button. A headset must be plugged into the jack to enable or disable headset mode. The programmed button on the phone must be pressed to initiate and disconnect a call. Depending on the age of your X16 phone, the unit may be equipped with either 2.5mm or 3.5mm headset jack. An adapter is required to facilitate the use of the 2.5mm or 3.5mm connector. 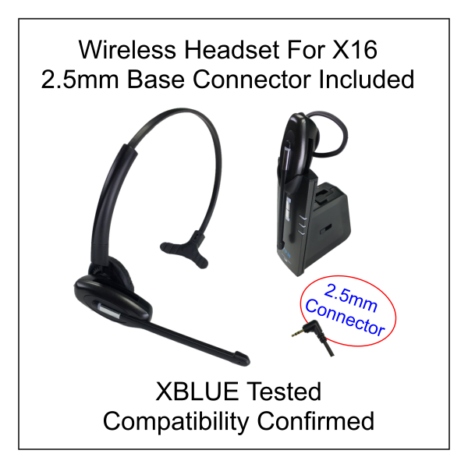 Headsets sold by XBLUE include the adapter required for operation with your XBLUE. Look at the label on the bottom of the phone identify the connector type. DO NOT order this headset if your phone has the "3.5HJ" indicator shown in picture on the right. More information is available at xblue.com/headset-compatibility.